For eleven seasons, Marion Ross was head of one of America’s favorite television households. WTSN’s Mike Pomp sat down with Actress Marion Ross. Mike Pomp is a broadcast veteran of New Hampshire with over for over five decades covering news and politics. 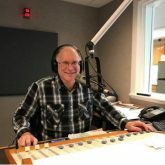 He was recently awarded the 2016 New Hampshire Air Personality of the Year (his second award) and the 2009 New Hampshire Broadcaster of the Year by the New Hampshire Association of Broadcasters.